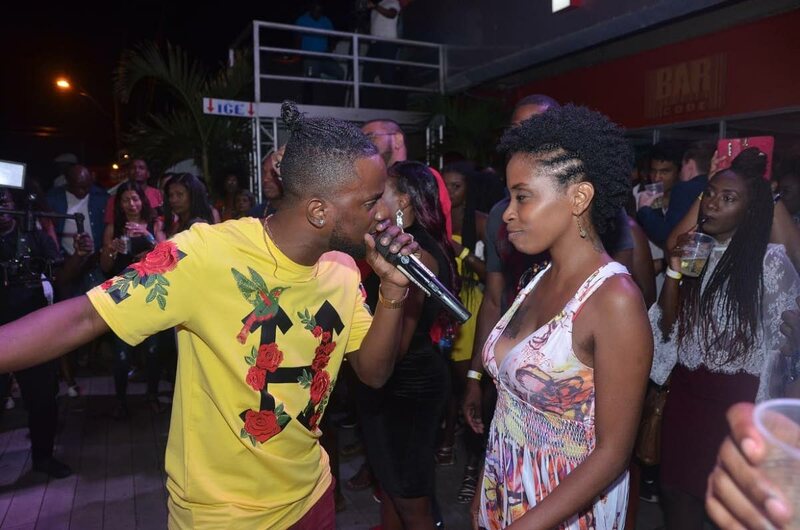 Reigning New Tobago Soca Monarch, Jhevon “Royale” Jackson sings to a patron at Barcode’s first event in the series, ‘I Love Soca,’ last week Tuesday at the Milford Road, Scarborough club. Seigning New Tobago Soca Monarch, Jhevon “Royale” Jackson says he will be defending his title against all competitors this season and that he plans to repeat his winning streak for a third straight year. “Of course, I would be defending my title. I feel confident... and I’m getting ready. You can’t go in with any other feeling. I am going with a mindset to win. “We have some things planned that we would like to do. If everything goes according to plan, I have a good chance of keeping the title,” he told Newsday Tobago in an interview on Wednesday. Jackson, 25, who hails from Goodwood, released A Place in September last year followed by Wine Dey in November 2018. His hopes of a hattrick, however, is dependent on whether the competition will be held this year, since no date has as yet been announced by the organisers, Men of Exile. Last year, the New Soca Monarch competition was coordinated by the Tobago Carnival Committee in conjunction with the Trinbago Unified Calypsonians Organisation (TUCO) and Men of Exile. The late Rennie ‘Stretch’ Dumas, a former Tobago East MP and Labour Minister, was responsible for the creation of the Tobago Soca Monarch, and the organising group, Men of Exile. Dumas died on May 2017 of heart-related complications. Jackson, who says he has been involved in singing soca since 2013, remains upbeat that a competition would be held this year but remains committed anyway to producing music for the season. “There is something about the tempo of soca music I love, it (soca) has a special place in my heart… the music other artistes produce and the songs I do myself encourages me to keep going,” he said. For 2019, he praises Aaron ‘Voice’ St Louis’ song Alive and Well. “Alive and Well has won me over for the season. There’s no other song like it out there ... such a message needs to be heard. “But… I’m in love with the music released thus far ... the newer artistes are doing very well also,” he said. Reply to "‘Royale’ seeks Tobago soca monarch hattrick"